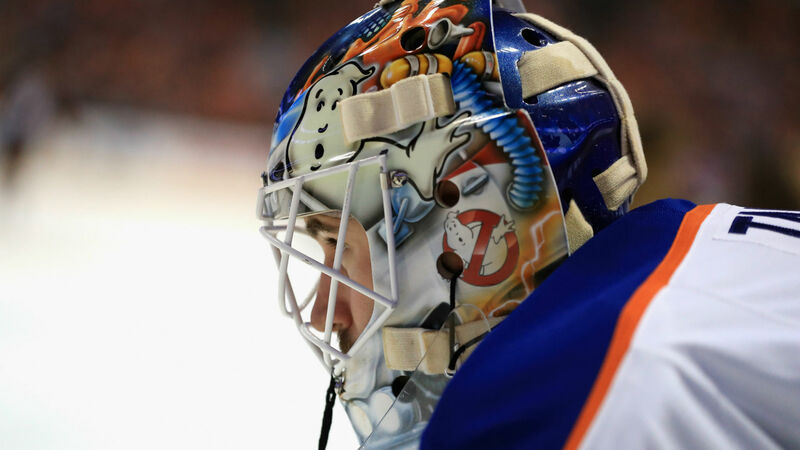 NEW YORK — For Cam Talbot, there were two games circled on his calendar for the last three seasons. This season was the same — Oilers at Rangers on Oct. 13 and March 11 when the New York visits Edmonton. But now, after defeating the Rangers (and old goaltending partner Henrik Lundqvist) 2-1 at Madison Square Garden on Saturday, he may only keep an eye out for those games. Undrafted, Talbot was signed by the Rangers in 2010 following three seasons at the University of Alabama-Huntsville. He spent time in the minors with the Rangers’ AHL affiliate in Connecticut before he was called up for good in October 2013. After making his NHL debut on Oct. 24 in a 2-1 loss to the Philadelphia Flyers, he earned his first NHL win two nights later at Joe Louis Arena as the Rangers defeated the Red Wings 2-1 in overtime. In two seasons on Broadway, the Caledonia, Ontario, native played in 57 games (started 53) with a .931 save percentage, 2.00 goals-against average and eight shutouts. As the understudy to a future Hall of Famer, Talbot would sit weeks at a time on the bench watching and learning. When Lundqvist went down with a vascular injury in 2015, Talbot was thrust into the spotlight and the Vezina Trophy winner put all of his support behind his fellow backstop. Talbot did not disappoint. In 23 games, he went 16-4-3 with a .929 save percentage, 2.16 goals-against average and two shutouts. His stellar play helped the Rangers capture their first President’s Trophy in 11 years. But his outstanding play not only put the NHL on notice, it made him a blue-chip trade prospect with Lundqvist solidified as the No. 1 goalie in New York. So, at the 2015 NHL Entry Draft — the same draft Edmonton selected Connor McDavid — Talbot was dealt to the Oilers for draft picks. Talbot immediately became No. 1 in Edmonton. Over his first three seasons, Talbot appeared in 196 games (193 starts) with the Oilers to go along with a 94-80-16 record, .914 save percentage and 2.65 goals-against average with 11 shutouts. In 2016-17, Talbot fnished fourth in Vezina Trophy voting, tied for the league-lead in wins (42) with the Washington Capitals’ Braden Holtby, while starting an an NHL-high 73 games. Now entering his fourth season north of the border, the trade still appears to sting the Oilers goalie as he was quick to point out it was his first time beating the Rangers since the draft day deal. In his four previous matchups, he went 0-4 with a .895 save percentage and 3.31 goals-against average. “There’s always the little motivators that exists in the games that you and I don’t know about and we could have guessed that one, obviously, but good for him,” head coach Todd McLellan commented.